Which Online Tax Service is Best? Now that tax season is here, consumers are looking for a reliable, easy way to file their taxes. Why not use an online tax service? These services allow you to easily and safely file your taxes online from the convenience of your own home. And the best part is they can cost much less than using an accountant. For those of you who are either new to e-filing or filing in general, it may be hard to determine the best online tax service for you because many seem to have similar pricing or share similar features. To save you some of the hassles, we’ve highlighted which services are best for all filers, best for audit support, best for your wallet and best for basic returns. If you’re a total tax beginner, new to e-filing or just someone who wants a no-hassle, fast filing experience, TurboTax is the service for you. TurboTax not only features a simple and clean interface that runs smoothly and quickly, but it also has the ability to take the information you input and use it to provide immediate suggestions that expedite the filing process. This automating of the process means that anyone can follow along and easily understand what they’re doing. Features like snap and auto-fill allow you to take images of important documentation, like your W-2, upload it to TurboTax and the service will automatically fill in the details for you — leaving less room for potential errors. The ease of this experience almost makes filing taxes feel like something pleasant and stress-free — almost as if you were ordering a pizza or shopping online. While filing a simple 1040 or 1040EZ federal return through TurboTax is free, prices for other returns are relatively pricey, starting at $34.99. H&R Block may be one of the pricier services we review — basic federal returns are free and upgraded plans range from $21.24 to $42.49 (prices include our 15% discount); however, that comes with a solid reputation and years of experience in the tax preparation industry. Aside from being a highly-recognized brand, H&R Block is a good name to have on your side if you find yourself being audited by the IRS. That’s because, for every filer who uses its service, H&R guarantees a minimum standard of audit support. Dubbed its Worry-Free Audit Support Program, H&R Block promises to help you correspond with the IRS and prepare you for an audit. You can also opt to have an agent support you before and during the audit experience. Filing taxes shouldn’t be a wallet snapping experience, and FreeTaxUSA allows taxpayers to ease up on their wallets, as the service offers both a Free and Deluxe edition. The Free edition supports the filing of most federal returns, which means you don’t have to upgrade in order to file more complex returns. Someone with something as simple as a 1040EZ or something as demanding as an 8829 (Business Use of Your Home) can use the Free edition to file their federal taxes. Although you have to pay for your state return, it costs you only $12.95 (or $11.66 if you use our discount). And in the event you do feel compelled to upgrade to the Deluxe account, it’s only $5.95 (or $5.36 with our discount) which is a far cry from the cost of most other services with deluxe offerings. The unfortunate trade-off is that FreeTaxUSA does not provide users with any professional tax advice, so a major degree of self-sufficiency is required to handle the service, especially when compared to many of its competitors which double as traditional in-person tax filing groups. With solid pricing and a decent reputation, TaxAct is an overall well-rounded service that’s a great option for those filing basic federal and state returns. While the prices aren’t quite as low as FreeTaxUSA (detailed above), they are still pretty reasonable with free simple federal and state returns and upgraded plans starting at $9.99. If you’re someone who prefers to ask questions while you file, TaxAct may not be the service for you, as it doesn’t have the most comprehensive tax support we’ve seen. For example, its professional tax support is either by email for all plans or phone for paid plans, while its competitors offer chat, phone, and email support. In addition, TaxAct’s plans are bare-bones and don’t include any sort of audit support — that costs $44.99. That said, TaxAct does have a simple, easy-to-use interface that takes you through step-by-step instructions to file both federal and state taxes. Combine that with reasonable prices and you have a great option for someone filing a basic return. Here are best tax preparation tools. Select which service you prefer and help other people new to filing online make the best decision. Which Online Tax Preparation Tool Do You Plan to Use This Year? 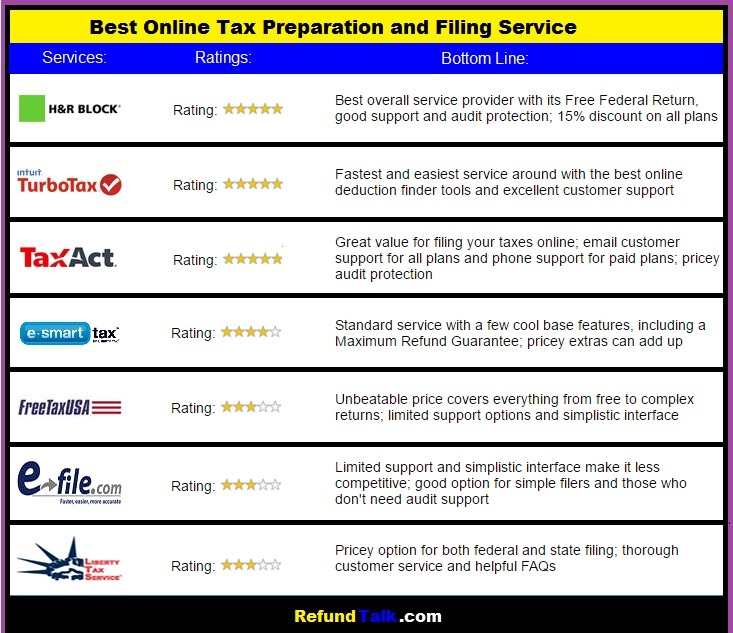 Who offers the best online tax preparation? Please share the story on Facebook and tell us because we want to hear YOUR voice! Come Join us! at the Brand New RefundTalk.com for 2017. Register and become a member take advantage of the simple to use community and forums. Bookmark our page and stop back often for more updates.